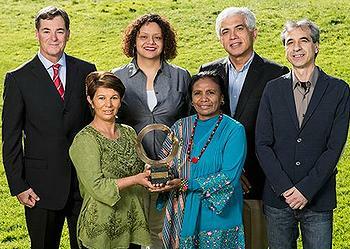 SAN FRANCISCO, California, April 15, 2013 (ENS) – The Goldman Environmental Foundation today announced the six recipients of the 2013 Goldman Environmental Prize, a group of grassroots leaders working to protect the environment and their communities. The Goldman Environmental Prize, now in its 24th year, is awarded annually to environmental leaders from each of the world’s six inhabited continental regions. With an individual cash prize of $150,000, it is the largest award for grassroots environmental activism. The winners were awarded the prize today at an invitation-only ceremony at the San Francisco Opera House. A smaller ceremony at the Ronald Reagan Building and International Trade Center in Washington, DC is scheduled for Wednesday, April 17. With no prior experience in grassroots organizing, Jonathan Deal led a successful campaign against hydraulic fracturing, or fracking, in South Africa to protect the Karoo, a semi-desert region treasured for its agriculture, beauty and wildlife. Giving up a comfortable living and family life in California, Azzam Alwash returned to war-torn Iraq to lead local communities in restoring the once-lush marshes that were turned to dustbowls during Saddam Hussein’s rule. An elementary school teacher, Rossano Ercolini began a public education campaign about the dangers of incinerators in his small Tuscan town that grew into a national Zero Waste movement. By organizing hundreds of local villagers to peacefully occupy marble mining sites in “weaving protests,” Aleta Baun stopped the destruction of sacred forestland in Mutins Mountain on the island of Timor. Kimberly Wasserman led local residents in a successful campaign to shut down two of the country’s oldest and dirtiest power plants–and is now transforming Chicago’s old industrial sites into parks and multi-use spaces. Unfazed by powerful political opponents and a pervasive culture of violence, Nohra Padilla organized Colombia’s marginalized waste pickers to make recycling a legitimate part of waste management. The Goldman Environmental Prize was established in 1989 by late San Francisco civic leaders and philanthropists Richard and Rhoda Goldman. Prize winners are selected by an international jury from confidential nominations submitted by a worldwide network of environmental organizations and individuals.